Comments: This is a small, friendly marina with good facilities. The ramp is good and the guest docks comfortable. Off-season, it is quiet. The Point restuarant is adjacent to the marina. -----"The Delta?" El asked with raised brows. "What Delta?" -----We were sitting in the cockpit aboard Halcyon in a tree-fringed, rock-bound, cove in Alaska with our cruising friend, Chris. It was sundowner time, and the steak was on the barbie and the Varied Thrush was trilling his evening call from the dark woods a few yards away. Halcyon swung gently on the turning tide with her twin, Rana Verde, rafted along side. Bright shafts of yellow sun streaked the sky overhead, tracing the outline of the snow-shrouded peaks to our west. It is the dreaming time - made for daytime dreaming of places past and cruising grounds to visit. Chris has a round, friendly face and dark eyes. He smiled as he repeated, "Have you two cruised the Delta? THE Delta! 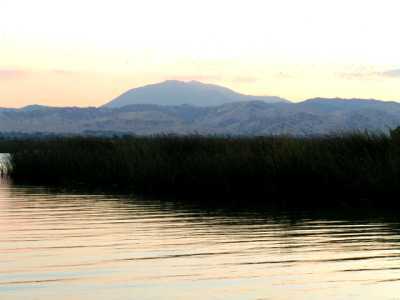 The California Delta." -----"Never heard of it," El said with a frown. "Do you know anything about it Bill?" -----"Oh, a little - just the name. Some C-Dory folks near Sacramento talk about the sturgeon fishing there, but that's all I know," Bill took an appreciative sip of his merlot, while watching an eagle land on a dead branch above the two rafted boats. -----"Well, you guys have a great treat in store," Chris stated emphatically. He turned the sizzling meat over on the grill and sat down, took a sip from his glass, and continued. "About an hour east of San Francisco is one of the most charming cruising grounds along the West Coast. 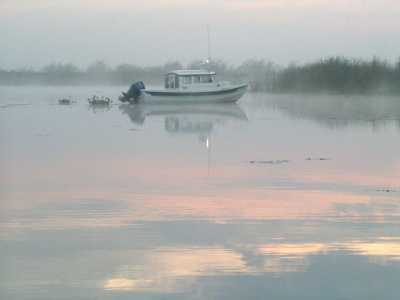 There's over a thousand miles of water to explore, most of it narrow, winding, isolated sloughs and backwaters. You'll love it." -----El's face lit up with that shine I have long ago recognized as the beginning of an adventure. She leaned forward toward Chris with an 'ah hah' look on her face. "How about joining us on a cruise this fall? You can be our guide." Thus was hatched the idea of cruising the California Delta. -----Now we sat again with our friend, Chris, only this time Halcyon and Rana Verde swung in unison to the ebbing current of the Sacramento River. We talked of times together, like cruising friends are wont to do -anchored with the Kushtakas in Thomas Bay, the bay of death; watching the brown bear working the meadow in Red Bluff Bay; swapping tales on the sand bar up the Escalante River. Now, we were about to cruise into the California Delta. New memories were in the making along the banks of the Sacramento.